We are at the beginning of the 21st century. The pace of scientific and technological development has accelerated significantly over the course of the last century. What will the future bring with it? The course is already being set today for the way we will live in the future, how we will age, how healthy we will be and which products and services we will be able to use. All of this is crucially dependent on how well Germany succeeds in ensuring a leading place for itself in the global information society. The basic precondition for this is a massive commitment to both the production of new knowledge and innovative technologies, and to their application and exploitation. Both science and technology made it possible for post-war Germany to develop into one of the world’s leading economies. The prosperity that was achieved also forms the basis for overcoming the country’s division. However, our future in the 21st century depends crucially on how we succeed in accessing the potential offered by new technologies and in selling top-quality products on the world’s markets. One aim of the mobile exhibition “Science Express” is to give the general public and young people in particular a basic understanding of the international research topics that are currently undergoing a particularly dynamic and promising development, and the ways in which these will influence our lives in the coming 10 to 15 years. Many of us are either completely unaware of these developments or have, at best, only a vague idea about them. 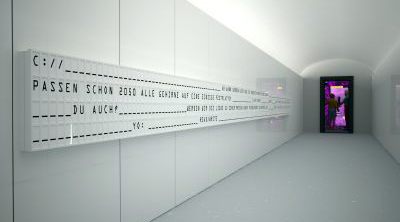 The exhibition aims to clarify the challenges that face not only Germany, but the entire human race. It seeks answers to global questions: How will we live with climate change? Where will we get our energy from in future? Will the Earth be able to feed us all? Other questions explored by the exhibition concern the everyday life of the individual: Do our genes determine our future? Will computers soon be able to think like people? Will robots manage our households? Will we be able to cope with a fully-networked world? The future is already being shaped today.